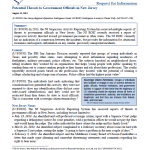 The New Jersey Office of Homeland Security and Preparedness (OHSP) compiles a statewide list of special events that provides situational awareness to law enforcement, as well as to assist in local planning requirements. Special events include any events that attracts large numbers of participants. Examples include concerts, marathons, parades, sporting events, holiday gatherings, etc. A map created by the New Jersey Office of Homeland Security and Preparedness depicting the source countries of foreign fighters in Iraq and Syria as of March 17, 2015. 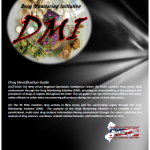 The New Jersey Regional Operations Intelligence Center (NJ ROIC) monitors New Jersey drug environment through the Drug Monitoring Initiative (DMI), providing an understanding of the presence and prevalence of drugs in regions throughout the state. 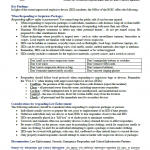 This pill guide is for law enforcement officers and public safety officials to utilize when encountering pill products during the course of their daily duties. 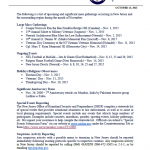 The NJ Office of Homeland Security and Preparedness (OHSP) compiles a statewide list of special events that provides situational awareness to law enforcement, as well as to assist in local planning requirements. Special events include any event that attracts large numbers of participants and spectators in both a public or private venue. Examples include concerts, marathons, firework displays, community celebrations, visits by VIPs, sporting events, holiday gatherings, etc. The FBI San Antonio Division recently reported that groups of young individuals in Texas, and possibly other states, were attempting to elicit information regarding residences of firefighters, military personnel, police officers, etc. The subjects knocked on neighborhood doors, telling residents they worked for an organization that helps young people with public speaking by sending them out to contact random people at their homes and ask about their professions. The youths reportedly received points based on the professions they located, with the potential of winning a college scholarship and a large sum of money. Police officer had the highest point value. 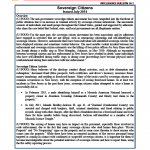 The anti-government sovereign citizen movement has been catapulted into the forefront of public attention due to an increase in criminal activity by sovereign citizens nationwide. 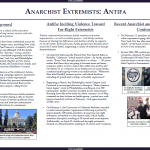 The movement consists of individuals and small groups throughout the United States, guided and supported by adherents who share the core belief that Federal, state, and local governments are all illegitimate entities. 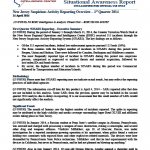 During the period of January 1 through March 31, 2014, the Counter Terrorism Watch Desk at the New Jersey Regional Operations and Intelligence Center (ROIC) received 315 incidents through the New Jersey Suspicious Activity Reporting System (NJSARS). 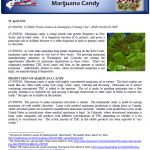 Marijuana candy is being seized with greater frequency in New Jersey and in other states. It is dangerous because of its potency, and poses a particular risk to children because it is often disguised as hard or gummy candy or chocolate. 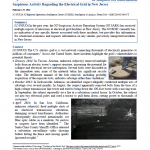 In the past year, the NJ Suspicious Activity Reporting System (NJ SARS) has received multiple reports of intrusions at electrical grid facilities in New Jersey. 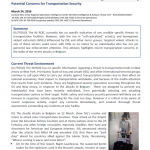 The NJ ROIC currently has no indication of any specific threats associated with these incidents, but provides this information for situational awareness and requests information on any similar, previously unreported incidents in New Jersey. In the year since Sandy Hook, there have been a combined total of 22 actual school attacks and disrupted plots nationwide with some of the attacks resulting in the deaths of students and school personnel. 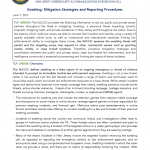 The New Jersey Regional Operations Intelligence Center (ROIC) has examined recent reporting on the Sandy Hook attack and the incidents over the last year and provides the following analysis to law enforcement, school resource officers (SROs), and administrators to assist in school security planning efforts. 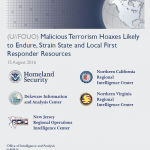 One of the most serious threats facing New Jersey and the entire U.S. Homeland continues to be that of the active shooter, regardless of motivation, who by the very nature of their associated tactics, techniques, and procedures, pose a serious challenge to security personnel based on their ability to operate independently, making them extremely difficult to detect and disrupt before conducting an attack. 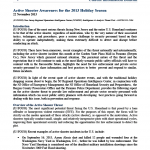 The New Jersey Regional Operations Intelligence Center (NJ ROIC) provides the following updated analysis of mass shootings in the last year (December 2012 to October 2013) in order to provide law enforcement personnel, security managers and emergency personnel with identified commonalities and trends, as well as indicators of potential violence. Websites and emails referencing the Boston Marathon bombing should be viewed with caution, as malicious actors are using the incident to disseminate malware and conduct fraud. 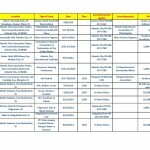 While other agencies investigate the frauds, the NJ ROIC provides this information for situational awareness. During recent weeks, various sources in law enforcement and media outlets have been reporting phone kidnapping scams occurring in Central and Northern New Jersey and New York. In most incidents, scammers have alleged that a member of the phone scam victim’s family had been involved in a car accident and claimed to have taken the victim’s family member hostage. The scammers then claim they will drop their hostage at a hospital after a certain amount of money (usually $1500‐2000) is wired via Western Union to the scammers, as restitution for damage to the scammer’s vehicle. In addition, the scammers state that they have the hostage’s cell phone and any attempts to call the cell phone or disengage from the conversation will result in the murder or beating of the hostage. 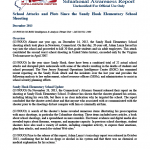 This report attempts to analyze the indicators and commonalities of recent school shootings in an effort to inform public safety officials and assist in the detection and prevention of potential school shooter plots or attacks. 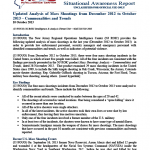 All incidents included in this assessment occurred in the United States while classes were in session. Domestic violence shootings and gang violence were not included in an effort to differentiate between “active shooter” incidents and other acts of violence. DHS defines an “active shooter” as an individual actively engaged in killing or attempting to kill people in a confined and populated area. This report examines the 29 deadliest mass shootings in the past 13 years, starting with the shootings at Columbine High School in Colorado in 1999, to identify commonalities and trends. These 29 incidents include shooting incidents in which at least five people were killed. In February and March 2012, unauthorized IP addresses accessed the Industrial Control System (ICS) network of a New Jersey air conditioning company, US Business 1. The intruders were able to access a backdoor into the ICS system that allowed access to the main control mechanism for the company’s internal heating, ventilation, and air conditioning (HVAC) units. US Business 1 was using the Tridium Niagara ICS system, which has been widely reported in the media to contain multiple vulnerabilities that could allow an attacker to remotely control the system. On January 25, 2012, police officers in Utah arrested two teenagers after discovering that they planned to bomb their high school. The plot was foiled because another student received suspicious text messages from one of the boys and notified school administrators. During the subsequent investigation, police were able to corroborate the initial tip. The two suspects had blueprints of the school and planned to steal a plane at a nearby airport after their attack. They told police they were learning to fly on a flight-simulator program on their home computers. As of June 2010, MS-13 members in Los Angeles have directed operational activities of new MS-13 members in Birmingham, United Kingdom, using gaming consoles such as Sony Playstation and Microsoft Xbox 360. The MS-13 leaders appear to be taking advantage of the devices’ voice over internet protocol (VOIP), text chat, virtual world, and video teleconferencing features, which allow them to communicate with fellow gang members overseas.